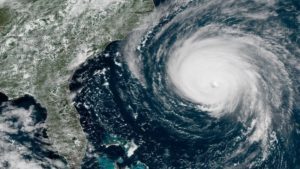 Waterkeeper Alliance and Waterkeeper groups in the Carolinas are preparing to document the potentially devastating aftermath of Hurricane Florence. Waterkeepers will be monitoring conditions at coal ash pits, factory swine and poultry operations, and other pollution threats to the states’ waterways. Video and images will be available here. Hardest hit will likely be the Neuse, Cape Fear, Lumber, and Pee Dee river basins. The Neuse and Cape Fear have the highest concentration of massive industrial swine sites. Both coal-fired plants and industrial animal agriculture operations store waste in unprotected open-air pits and cesspools, some of which are larger than football fields. As soon as it is safe to fly, Waterkeeper Alliance and Waterkeeper Organizations will be overflying power plants and industrial agriculture operations to document any flooding. Ground patrols will also commence as soon as they can be safely conducted. North Carolina environmental agencies permitted swine lagoons and coal ash ponds to be sited in the floodplains of the state’s rivers. The result is that when storms with high rainfall occur, these industrial waste sites flood and rivers become devastatingly polluted with coal ash and waste from industrial animal production facilities. In 1999, flooding from Hurricane Floyd dumped massive amounts of raw animal waste from industrial meat production facilities into the Neuse River. As climate change causes more and more of these devastating weather events, we simply cannot afford these continued assaults upon our waterways and communities. Click here to read about our North Carolina “Fields of Filth” report and connect to a map of all the industrial poultry and swine farms in North Carolina. As the storm moves inland, Waterkeeper groups in South Carolina will be monitoring threats in that state. Fortunately, unlike Duke Energy, the utilities in that state have removed much of the coal ash from riverside impoundments and there are far fewer, and less concentrated, industrial animal agriculture operations. However, structural failure of dam infrastructure is a major concern in South Carolina. Throughout the storm, Waterkeeper groups in the Carolinas will continue to monitor threats to water quality in addition to the aforementioned high priority targets.